Two specially-trained dogs have become the first assistance dogs in the UK to help people with dementia. Kaspa and Oscar are part of a project to investigate how a dog may bring benefits to people with early-stage dementia. The project, which was generated by students at Glasgow School of Art’s Product Design department, began in 2012 as the two dogs underwent 18 months training to offer practical assistance and help to reduce social isolation and anxiety levels. A further two dogs have already begun their training with the support of Alzheimer Scotland, Dogs for the Disabled and Guide Dogs Scotland. Helen McCain, director of training at Dogs for the Disabled believes the project could herald a new era in the way people with dementia and their carers are supported at home. "For 25 years we’ve been training assistance dogs for physically disabled adults and children and more recently for children with autism," she said. "This new project has provided us all with an opportunity to bring together our skills and experience to help with a different kind of challenge. We believe that the dementia assistance dog could make a significant contribution to the Government’s National Dementia Strategy." As puppies, Kaspa and Oscar spent their first year with experienced volunteers learning to be well-behaved and well-mannered young dogs. At just over a year old they moved into the Guide Dogs Training Centre at Forfar, where they were trained for their new role, with the specialised help of staff from Dogs for the Disabled, based in Banbury, Oxfordshire. In March, the duo completed their training and went to live with couples Frank and Maureen and Ken and Glenys from Angus. Maureen and Ken were recently diagnosed with early stage dementia and the couples were already receiving support from Alzheimer Scotland. Oscar and Kaspa have settled in well to their new homes and are already making an impact on the lives of their new partners. Both dogs have been trained to fetch medicines when a reminder alarm goes off. The dogs can take items between the two couples and can also be trained to help wake a person up. 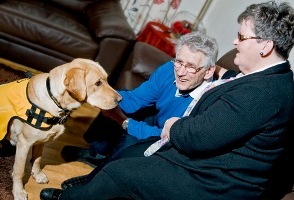 Since the dogs have been introduced into their home, Glenys said that she now has to spend less time giving reassurance to Ken because Kaspa gives him a calming new focus (pictured). Joyce Gray, deputy director of development at Alzheimer Scotland said: "Dementia Dog has had a truly wonderful impact on the families involved and Alzheimer Scotland is delighted to have been part of this ground-breaking project.